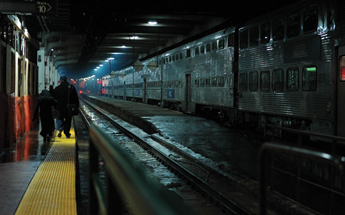 Commuters who ride passenger trains such as the Metra and Amtrak are exposed to "really extreme levels" of unhealthy particulate matter. Photo by Christopher Danzig. Air pollution might be the last thing on busy commuters’ minds as they wait for trains to pull into Union Station. But inside Union Station, on the platform and even inside the train, people are exposed to particulate matter at levels far exceeding what the U.S. Environmental Protection Agency considers safe, according to testing done by the Clean Air Task Force commissioned by Respiratory Health Association of Metropolitan Chicago last year. Clean Air Task Force senior scientist L. Bruce Hill found particulate matter at concentrations of 844 micrograms per cubic meter on the Union Station platform and 192 micrograms per cubic meter inside the station. The EPA considers a daily average exposure over 35 micrograms per cubic meter unsafe. Nationwide most attention to the health and environmental hazards of locomotives has been pointed at the freight sector. But with some exceptions, like the electric South Shore commuter line, passenger trains also burn the same diesel fuel and raise serious health issues for passengers and communities surrounding rail facilities. While freight companies are private and can only be forced to do things through laws or regulations, passenger lines like Metra and Amtrak are essentially government-run. Urbaszewski notes that government officials could decide to burn cleaner fuel and install more pollution controls on trains. Chicago planners are also hoping to launch a regional high-speed passenger rail project, with trains going 110 or 220 miles per hour, either on existing or new tracks. They say this would improve air quality as a whole, since it would mean fewer cars on the road. High-speed rail advocates are hoping for some of the $8 billion in stimulus funds the federal government has promised for high-speed rail nationwide. Since the locomotives would be new, they would likely have top-ofthe- line pollution controls and would burn the cleaner diesel fuel.